These are lyrics by Chemical Brothers that we think are kind of repetitive. Chemical Brothers', "Block Rockin' Beats"
Yes, the beat is good and I know it, but your redundant lyrics are kind of ruining the song! Chemical Brothers', "Hey Boy, Hey Girl"
There are no other lyrics! Wednesday! Wednesday! Wednesday! Wednesday! Wednesday! Wednesday! Wednesday! Wednesday! Wednesday! Wednesday! Wednesday! etc. 6 years later*... Okay, stop this bloody Wednesday rubbish! It's the only lyric in the whole song. It is irritating and can make you mad. It'll be bloody Wednesday by the time the song finishes! I hate this song! Turn it off! *It doesn't really go on for over 6 years, I'm grossly exaggerating. It goes on for a few hours, though! 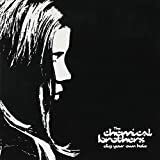 Chemical Brothers', "Where Do I Begin?" This line is repeated over a dozen times!!! It can drive someone crazy!